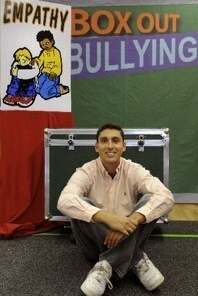 Jeremy is a leading expert in combining research based bullying prevention techniques with interactive live theater. He also specializes in creating media campaigns and curricula to bring dynamic, evidence based bullying prevention to the entire school community. Jeremy graduated from The Pennsylvania State University-University Park, with degrees in Journalism, Theater, and History. He also holds a Certificate in Arts Education from Long Island University, NY. He has also studied under famed performer Avner Eisenberg, earning a Certificate in Eccentric Performance from The Celebration Barn Theater in South Paris, Maine. So, using audience participants, improvisational comedy, and innovative multimedia, Box Out Bullying made its debut in November of 2008. Since then, Box Out Bullying has received rave reviews and has been experienced by tens of thousands of students each school year. What started out as a personal mission has turned into a grassroots movement. Bullying has now been recognized as the societal issue that Jeremy always saw it as. Now, more than ever, when educators, proactive parents, and other concerned community members come to Jeremy for help, he brings the data, the product, and the proven track record of success in improving their school social dynamics and communities and a whole. Jeremy has been in the forefront on this national epidemic, as an educator, as a national speaker, traveling to communities from Crossville, Tennessee to Madison County, Florida, Harlem, New York to Tell City, Indiana, the Northeast Kingdom of Vermont to Washington, D.C. and everywhere in between. What he has found is that the issues facing our children are the same. But the solutions are the same too!